I had the pleasure of interviewing Hindi Jain, Founder & CCO of the “Words Collection”. I grew up in mother’s shophouse boutique, the “Shop of India” on the east coast and traveling trade-shows with my father who was a serial entrepreneur. I started doing henna tattoos outside the shop when I was only 10 years old as my version of a lemonade stand. Through that experience, i've met a lot of people over the years - I’ve done over 20,000 tattoos - and noticed that many of these people like to get meaningful words in different languages on their wrists, ankles, and back of neck (placement that was personal to remind them of messages that matter). I took inspiration from the experience of giving these tattoos and channeled it into a conversational clothing line. I've placed inspiring words on clothing where you would normally see tattoos. The idea is that it's personal and meant to spark conversation in the same way a tattoo would. When I would sit and talk with these people, they often wanted these words tattooed as a reminder to themselves to be or do something, like “love” or “happiness” in different world languages. After having words of positivity drawn in henna where they could easily see, they would often come back to tell me about how those words changed their day. Starting my own label was something i’d always dreamed of doing, but the fear of the unknown held me back. What if I left my job and failed on my own? The prestige of having a label to associate myself with gave me confidence. Growing up with parents who strayed from the typical career paths of their generation, I never felt like I needed to follow a stereotypical career path. It was quite the opposite; seeing the inside life of two entrepreneurial parents taught me just how hard it is to run your own business – work never stops. As a result, I was drawn to corporate careers that were more structured and promised a steady income. Over time, through my experiences working for private labels and corporate fashion powerhouses, I learned that the more you grow within those institutions, the more it becomes like you’re running your own business within their business. For anyone deciding whether or not to take the plunge into starting your own business, I would say that if you have a vision and it feels right, you only have one life to live. If it was a mistake and you try and fail, you’ll come back stronger from everything you learned along the way. The greatest thing is, if it’s a success, dreams came true. 2.) Yitzi: Can you share the funniest or most interesting story that happened to you since you started your company? I’ve realized the dangers of being female. Trying to raise money for a start-up is difficult enough, but add being ethical and female into the mix and it becomes that much harder. The most insane things have happened in my life since leaving the corporate world. Men would offer to try to help me in the most absurd ways, including but not limited to offering to buy me a factory! Many would pretend to show interest or be of help as a means of opening up conversations with the hope that it would lead to more. Being ambitious doesn’t mean i’m willing to sacrifice my integrity to get ahead. In the end, I decided to start small and build up from there. I did a kickstarter campaign and raised $25K in pre-sales. Truth be told, i’d never do it again, but I learned volumes about the unique preferences of my target market and psychological behavior my own community in the process. 3.) Yitzi: So what does your company do? It creates a wearable experience with everyday clothing. It’s a great way of sparking conversation, learning something personal about someone you don't already know, and a positive reminder to self. 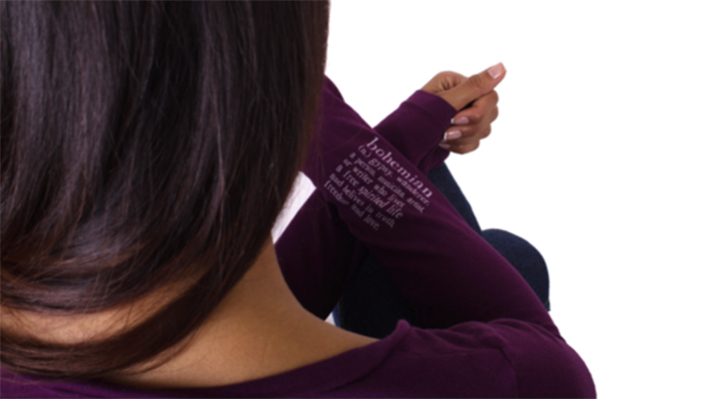 Each item features positive words in different languages placed where one might normally see a tattoo; it comes with a hangtag that gives you a call to action. The inspiration came from my experiences creating over 20,000 henna tattoos from a business I started at 10 years old. 4.) Yitzi: How have you used your success to bring goodness to the world? Each item that I sell creates a positive chain of events. The factory gets work, the user feels good when they wear the clothes (they’re animal cruelty-free “Peta Approved” vegan), the strangers they meet along the way get to spark a positive conversation, and finally a percentage of profits are donated to organizations that promote equality for humanity. 5.) Yitzi: What are your "5 things I wish someone told me before I launched my Start-Up" and why. Find a co-founder/business partner. It’s possible to do it all on your own, but you’ll waste a lot of time. Building a team will enable you to scale faster. You might have the greatest product ever invented, but it won’t matter if no one ever hears about it. Make friends with fellow entrepreneurs and build your support system. Surround yourself with people who want to see you succeed. Chances are most of your friends work 9-5, and once you get off that cycle, it’s socially isolating. Keep track of the things you do everyday so you’re always able to measure your own progress. It’s natural to feel like you’re not progressing at the rate you initially projected. Keeping track is a good way to check-in with yourself. Don’t believe what you see on instagram. People will make assumptions about the success they assess you’ve achieved according to the photos you post on online. What they don’t see is that behind each benchmark for achievement posted is a lot of hussle and hard work that probably didn’t happen in an “instant”. Advice overload is really real. You will likely receive loads of contradicting advice from many well intentioned people. Pick and choose the advice you want to digest and use your instincts. While other children were setting up lemonade stands to earn a few dollars, Hindi Jain at 10 years old was applying henna tattoos from a sidewalk stand in front of her parents’ retail shop in downtown New Hope, earning enough money to travel internationally. Inspired by those early days of designing tattoos for thousands of residents and visitors to the iconic Bucks County community, Jain, 29, has launched a career as a fashion designer. Her line of leisure wear, called the Words Collection, features messages of positivity and meaningful words woven into the fabric of each garment. Jain’s parents are natives of India. Her mother, Neelam, was an art professor and her father, Arvind, was operating 17 clothing stores across the U.S. when the couple married. In 1971, they moved to New Hope and opened the Shop of India. Growing up, Jain and her brother and sister lived with their parents above the family’s corner store on South Main Street. Jain’s mother inspired her to pursue a passion for art. “That was almost like a family bonding thing. We would hang out and paint together, and my mom would teach me how do henna tattoos,” Jain said. After that first year of tattooing, Jain set up her henna tattoo stand on the sidewalk in front of the Shop of India every weekend. She estimates that she served more than 20,000 people on the weekends and summers up until she graduated from New Hope-Solebury High School in 2005. Made of a paste from the henna plant, it can be applied to the skin and leaves an orange or maroon stain that fades away in one to two weeks. Traditionally, henna is applied in intricate designs to the hands and feet for celebrations like marriage ceremonies. While applying the henna tattoos as a teenager, people shared intimate stories of love and loss. Most customers asked for positive words to be written on their wrists, ankles and the back of their necks. Those words were powerful to those who needed them the most, said Jain, recalling one teen who asked her to write “Love” in cursive over cuts he had made to his wrist. Those encounters sparked the inspiration for what would later become her first clothing collection. While in high school, Jain was awarded a scholarship to enroll in courses at Moore College of Art & Design in Philadelphia. Later, she went on to earn a degree in international business and marketing from Drexel University. In her early 20s, Jain landed merchandising positions with Ralph Lauren and Ann Taylor companies in New York and BCBGMaxAzria in California. In December 2014, Jain left the corporate world and packed her bags for India. By the time she launched a Kickstarter campaign in November 2015, she had designed her first collection, established Hindi Jain LLC and developed a plan for its manufacturing with factory owners in Jaipur and New Delhi. The Words Collection is a comfortable leisure and yoga wear clothing line for men and women. Inspiring words are placed on high-quality clothes in places where you would normally see tattoos. The clothing is sold online and at Dig Yoga and Bucks County Dry Goods in Lambertville. A percentage of the profits are donated to organizations that promote equality such as Trevor Project, Girl2B and Farm Sanctuary. “This is really a culmination of my background and skills and desire to do something positive in life," Jain said. Hindi Jain sits outside Shop of India in New Hope. The little girl who used to sell henna tattoos outside her parents’ shop in New Hope 20 years ago is all grown up, and so is her business. These days, Hindi Jain is applying the tattoo concept to a line of clothing, and with her garments, she hopes to change the world. Sometimes, the stories she hears are heartbreaking, and she has seen many wrists that bear the scars of those who have lost hope. “I’ve met quite a few people who have slit their wrists,” Jain said. “It’s really sad, but they want to share. They want to be consoled. And often they want the word ‘love,’ in cursive, tattooed on their wrists. Thus was born the Words Collection. From 4 to 10 p.m. Thursday, Sept. 22, Jain will launch her line of “meaningful clothes that promote equality for humanity” at Shop of India, 76 S. Main St. – which happens to be the oldest boutique in town, established in 1971. The garments are for casual wear and yoga, and each features a word, symbol, quote or definition, all designed to inspire positive thoughts. At the event, you can meet Hindi Jain, mingle with local yoga instructors and learn techniques to meditate anytime, anywhere. Words Collection items will be for sale, with a free make-up/toiletries bag with every purchase. Also, $50 worth custom henna tattoo design will be raffled. It seems everything in Jain’s life has lead her to this confluence of tattoo art and fashion. While at New Hope-Solebury High School, Jain took fashion-design courses via scholarship at Moore College of Art and Design in Philadelphia. Next, she studied international business and marketing at Drexel University. While there, she worked for a private label of Ann Taylor as a design assistant. After college, Jain spent three years with Ralph Lauren in Manhattan. After that “tremendous learning curve,” she moved to BCBG MaxAzria. This year, after a successful Kickstarter funding campaign, Jain spent four months in India overseeing the entire production process, finding the highest quality materials and ensuring that the garments were made in factories where workers are treated ethically. As eager as Jain is to succeed, she is equally as keen to share her success. A portion of all her profits will go to an organization in India that supports young women from slums by providing education, housing and job placement, called Girl to Be. Locally, she plans to work with the Trevor Foundation, a national organization providing crisis intervention and suicide-prevention services to lesbian, gay, bisexual, transgender and questioning young people ages 13 to 24. There’s no question where Hindi Jain stands. READ MORE AT BUCKS COUNTY HERALD. I grew up in mother’s shophouse boutique, the “Shop of India” on the east coast and at trade-shows where my father sold wholesale menswear – entrepreneurship & fashion were ingrained in me for as long as I can remember. Prior to creating the words collection, I worked at BCBG MaxAzria, where I launched the global handbags & accessories merchandising division. I was encouraged to join BCBG MaxAzria after spending 3 years in the Global Men’s merchandising division for Ralph Lauren. I’ve completed several design courses via a scholarship at Moore College of Art and Design and graduated with a degree in international business & marketing from Drexel University. (2) How do you deal with setbacks? Setbacks are always disappointing but I try to put it in perspective. I try to focus on the positives that come out of every setback and use that knowledge to grow & learn from. (3) How did you get started? I found myself in a position where I was forced to question my Jain values. BCBG MaxAzria used to be one of my favorite companies because I knew I could count on them to deliver high fashion that was animal friendly; they were PETA approved. At the end of my career there, they started to introduce fur into the collection. My job as the head of global merchandising for the handbags and accessories division was to ensure that the regional buyers of the world bought the entire line. It was disgusting and I was upset that I was expected to handle these new fur products. I brought the issue up to the owner of the company and she responded that it had been many years since their promise to PETA and it was no longer valid. I was in a moral conundrum, my job duties no longer aligned with my Jain values. Everything happens for a reason though, this lead me on a different path. I decided to create my own line of animal friendly clothes, but more than that, I wanted to change current perceptions for luxury brands about “made in India”. I want to highlight India’s heritage in craftsmanship to the world and encourage luxury designers to source production more inclusively. (4) Who is your ideal target audience? People who appreciate comfy clothes, like yoga, and want to travel. (5) Who is your role model? My mom. I really admire how she balances being a hard working business woman and applies Jain principles to everyday living – like waking up every morning and practicing yoga followed my meditation – or choosing not to carry leather products in her shop (even though that could mean greater profits). (6) What advice do you have for those considering entrepreneurship? Well, I think we all think about it, but all those worst case “what if” questions arise like “What if I leave my steady paying job and fail in entrepreneurship – what will people think?”. There’s no right answer when it comes to taking the plunge into starting your own business. If you have a vision and it feels right, you only have one life to live. If it was a mistake and you try and fail, you’ll come back stronger from everything you learned along the way. If it was a success, dreams came true. (7) Your website has five core values – humanity, culture, world, fashion, and equality. How do you try to incorporate Jainism values on a daily basis while also being strong to the five core values of your business? Ahimsa (Non-Violence): All of my products are animal friendly. Satya (To Speak the harmless truth only): This collection promotes equality for humanity. Anekantvad (Multiplicity of Views): The clothes have positive statements written on them, so while wearing them, you are absorbing these positive thoughts and sharing them with others who take notice. Hindi Jain creates meaningful yoga wear & casual clothing inspired by henna tattoos. The “words collection” takes its name from the nature of its designs featuring meaningful words, quotes, and definitions placed where tattoos would be; creating an enchanting visual impact with a much deeper, energizing meaning. The collection is made with high quality fabrics that are soft and luxurious to the touch and fittingly designed for widespread wear-ability. The idea is that you are sharing a secret; it’s personal like a tattoo. It’s for you and to reinforce words that inspire your life. The collection aims to spark conversation & connect people in the same way as tattoos typically do. READ MORE AT YOUNG JAIN PROFESSIONALS. Hindi Jain’s new yoga/weekend leisure line called the “Words Collection” is a conversation starter. This empowered female designer strives to create meaningful clothing that promotes equality for humanity. Jain’s mission is commendable, bringing new meaning to the words fashion statement. Hindi Jain’s Words Collection is a series of casual weekend wear and yoga pantsfeaturing inspirational words, definitions, and quotes that reinforce happiness and positivity. You can choose your silhouette, quote, and the placement of the words on your clothes, such as the inside of your wrist, small of your back, or sport it on your ankle. The words are delicately placed where a tattoo would be. It’s going to make for an awesome holiday gift, and it’s so personal. All of Hindi’s trims are high quality and ethically sourced from around the world. The young designer started creating henna tattoos when she was only 10 years old, and built her foundations working for top quality designers like Ralph Lauren and BCBG Max Azria. Her motto? ‘No Titles. No Borders. World Citizens.’ Jain tells us, “My collection creates a statement for young women around the world that we can do any and everything with the right motivation, skills, and network of amazing supporters. We can make an impact both locally and globally. We are bridging worlds, and increased understanding and equality is the effect.” Hindi’s collection is an agent of change. Meaningful clothes that create equality for humanity– plus the stylish and comfy yoga weekend wear to boot. You can help Hindi in her powerful mission by purchasing an item from her →Kickstarter campaign TODAY ONLY! Simply select a funding amount, and the item you’d like to receive. You’ll be among the first to score yourself a long sleeve t-shirt, tank top, or a pair of yoga pants from her signature line! READ MORE AT MALIBU CHRONICLE. When I heard about fashion's new IT girl, Hindi Jain, and her first signature collection, I was inspired. Inspired to shop her line? Well that's part of it, but it was the young designer's powerful message that resonated with me. The strong-minded and talented fashionista strives to create meaningful clothing that promotes equality for humanity. Jain's mission is commendable, bringing new meaning to the words fashion statement. Hindi Jain's Words Collection is a series of casual weekend wear and yoga pants featuring inspirational words, definitions, and quotes that reinforce happiness and positivity. You can choose your silhouette, quote, and the placement of the words your clothes, such as the inside of your wrist, small of your back, or proudly sport it on your ankle. The words are delicately placed where a tattoo would be. I'm ordering matching yoga pants for my sister and myself as we've always wanted matching tattoos, but in my family, that's a no-no. It's going to make for an awesome holiday gift, and it's so personal. I can't wait to sport them and think of her. All her trims are high quality sourced from around the world. The young designer started a henna line when she was only 10 years old and has worked for top quality designers like Ralph Lauren and BCBG Max Azria (two of my personal faves). Hindi Jain knows quality materials, and has learned the value in spreading positivity worldwide. For this reason, she's won over our fashionable hearts as Popdust's Designer to Watch! Hindi's collection is an agent of change. Meaningful clothes that create equality for humanity--plus the stylish and comfy weekend wear to boot. You can help Hindi in her powerful mission by purchasing an item from her →Kickstarter campaign for one month only! Simply select a funding amount, and the item you'd like to receive. You'll be among the first to score yourself a long sleeve t-shirt, tank top, or a pair yoga pants from her signature line! READ MORE AT POP DUST. READ MORE AT ON MOGUL. READ MORE AT DREXEL UNIVERSITY LEBOW COLLEGE OF BUSINESS.